I may not work for Research In Motion, QNX, The Astonishing Tribe or Teknision, but a good UI idea is a good UI idea regardless of where it comes from. And this is a GOOD IDEA and I hope RIM reads this and implements it asap on the BlackBerry PlayBook. Without contention, the least liked hardware feature of the BlackBerry PlayBook is the power button (see our BlackBerry PlayBook Review). It's tiny and can be tough to press, which isn't a great thing considering powering on and off the display from standby is something that gets done a lot on a tablet. The good news is that you can do a pretty good job avoiding the power button on the PlayBook, especially when waking the screen from standby, as there is a sweet built-in gesture you can use instead. All you need to do is swipe from bezel to bezel, either top to bottom or side to side with one finger and the display will automatically turn on. Brilliant! Not so brilliant though is powering off the PlayBook, which still requires either a tap of the power button or you can simply leave it on and let it time out to standby (which eats a bit into battery life and isn't useful if you're putting the PlayBook back into a case so want it immediately turned off). So how do we do solve this problem? With CrackBerry Kevin's patent-pending two finger bezel-to-bezel swipe!! If you can swipe with one finger from bezel to bezel to power on the display, why not set it up so that swiping with TWO fingers from bezel to bezel powers OFF the PlayBook's display. Simple. Effective. And man would it make me happy. 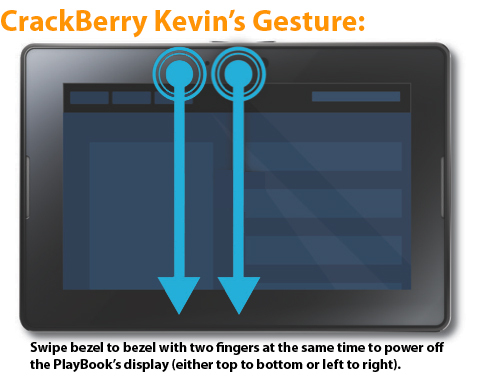 With this gesture you could now get away with never touching the power button, except when starting up a PlayBook that was completely shutdown (since there's now a software power button app that allows for a restart or full power down). And if two finger swiping proves to be a technical hurdle, the fall back could be to use top to bottom swiping to power on the display and left to right swiping to power it down (single finger). Either or works for me. Are you with me PlayBook owners and future QNX-BlackBerry Smartphone owners? Using power buttons is soooo old school. Let's get this one done RIM!!! !